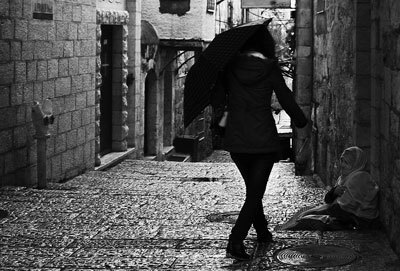 Beggar in Jerusalem Old City by Jerusalemgifts. Wikimedia Commons. It is one of the more common sights in certain parts of Jerusalem. A man or woman standing on the side of the street asking for money from those who pass by. In the Old City, especially near the Kotel, beggars dressed in religious garb target tourists, exchanging blessings or red strings for coins. At pedestrian malls and the central bus station, men and women in their twenties busk or hold handmade signs asking for help. For the residents of Jerusalem, however, particularly those who live in wealthier and observant neighborhoods such as Har Nof, Bayit Ve-Gan and Sha’arei Hesed, the beggars often come to the door, the same ones every week or month. They are part of the neighborhood’s color and pattern. You get to know them. Begging might not be the oldest profession, but it certainly goes back thousands of years. The biblical injunction states, “Open thy hand unto thy poor and needy brother” (Deuteronomy 15:11). My husband, Hillel, took the directive to heart and, at first, gave generously—after all, how can you send a person away empty-handed? This brought carloads of people to our home in Jerusalem’s Rehavia neighborhood: groups from Beit Shemesh, shady-looking characters coming all times of the day and night without respect for our privacy. I realized that just as we perceived them as “other”—not always recognizing their humanity—they also did not recognize that we were human with our own needs. We were just an ATM to them. Eventually, we curtailed our giving and fewer people came. These days we give around $10 to each of the 10 who regularly visit us, climbing up the three flights of steps to our apartment. They have become familiar, a part of our life. We crossed the border of alienation. There is Shefer, a mild man in his forties who comes to our door dressed in a shabby suit. He appears weekly, right after Shabbat is over, and waits with a bemused smile as my husband runs to bring him a drink. Amos, who looks around 55, wears a vest and beret and shows up once every three weeks. He is vision-impaired and grew up at a time when the disabled were not taught to be self-sufficient. Minimizing the distance between us, he often says, “I tell everyone that Furstenberg is not as rich as you think.” He has become our protector, also inquiring about our health problems. Another frequent visitor prefers to emphasize our differences. Boarding an airplane to New York, he was surprised to see us in economy class. “Why, you’re in economy class just like me!” he exclaimed. (Some beggars travel to the United States to solicit funds for themselves, charities and yeshivas.) And then there is Shekalim—yes, his name is actually that of Israeli currency. A large, lumbering man who might have a borderline IQ, he is endearing and good-natured. At one point, he said he needed help with his son’s bar mitzva and asked for a little more money. A few weeks later I asked about the bar mitzva and he just looked at me, puzzled. He comes with a sidekick, a 35-year-old man, but it is not clear if Shekalim introduces him to his “clients” out of the goodness of his heart or receives a cut. The community of beggars who think of our neighborhood as their territory share information about clients. And when we return from a trip outside the country, word gets around—without even using Facebook. The rabbis of the Talmud were aware that among those asking for handouts were frauds and cheats. “Whoever does not need and takes will, by the end of his life, become dependent on charity. He who is not lame or blind and pretends to be will become like one of them” (Ketuvot 68a). But the general thrust of the rabbis is to trust and give charity, for fear that the habit of giving to the truly needy will disappear. The group that comes to my door—there are Ashkenazim and Sefardim, but all identify as ultra-Orthodox—are part of the tradition of supporting the indigent in the Land of Israel. The Torah says to give to the poor, and they allow others to fulfill that function. Many come to our door with specific problems: a wife who needs an operation, a child with special needs, a daughter who has to be married off. They come waving welfare evaluations, bills. But when these requests repeat themselves incessantly, it is difficult not to be skeptical. Yet there have been occasions when the need proved to be true. My son, Yeshayahu, was on a bus when an ultra-Orthodox man sitting next to him, who saw his family name on his iPad, asked whether he knew Hillel Furstenberg. “He’s my father,” my son replied. There are many stories of generosity. One friend who lives in the Jewish Quarter of the Old City befriended a man who came to his synagogue every day asking for tzedaka. When the man became sick, this friend collected for him at the daily services. In the area of Sha’arei Hesed, one indigent woman lived in a shul, refusing to accept housing provided by social services. At the same time, she always looked clean because she frequently showered at a congregant’s house. There are different kinds of beggars in Jerusalem and it is difficult to get their exact numbers. According to the Jerusalem Welfare Department, the most visible group posts themselves near the bus station, Ben Yehuda Street, the Kotel and the ultra-Orthodox neighborhoods. They tend to be over 40 and most beg to supplement their income. Each night, they leave their “territory” to return home. Some come from Arab areas. There is no law against begging in public, and welfare workers cannot stop them or force them to receive aid. Approximately 35 percent of Israelis live below the poverty line. And there are many social benefits for the ill or incapacitated. There is also government support. A couple with two children who earn less than $1,300 per month can receive supplementary income of $750. There are also school grants and heating grants in the winter. Yet, “Begging in Israel, An Exploratory Study,” one of the few large-scale studies of the subject, completed in 1980 by David Shichor of California State College in San Bernadino and Ruth Ellis of Tel Aviv, indicates that “begging and beggars in Israel have a somewhat more positive public image than that found in most other industrial societies.” Beggars’ self-image, too, is less negative than in many other societies. And, according to a recent article in Globes magazine, beggars stationed at the central bus station received an average of $15 an hour; the minimum gross hourly wage in Israel is $6. A friend once castigated a nicely dressed young man who was asking for handouts at the bus station. “Why don’t you work?” she inquired. Begging can take on the characteristic of a small business or career. “They have a regular place of work, like an office, where they go every day,” says Eliezer Jaffe, professor emeritus at Hebrew University of Jerusalem’s Paul Baerwald School of Social Work and Social Welfare. “They cultivate clients, often sell lists, much like professional fundraisers. “It is sad, though, that the community has not solved the problem,” he adds. “It has to target the indigent, pick them up and train them before they get to the breaking point.” Jaffe has created the Israel Free Loan Association to help people in debt. It also lends money to small businesses. In Jerusalem, giving charity can take on a spiritual dimension. The late poet Zelda once said, “a beggar can be the Messiah.” The Midrash says he can be a hidden Elijah, a messenger eliciting good in the world. Historically, begging is a structured part of Jewish society. It was overseen by a system of charity called halukka (halves or quarters), which dates back to the rabbinical period, when Jewish academies in Israel suffered Roman persecution and were supported by Jews from the diaspora. In the halukka system, a committee in the diaspora used to solicit funds from sympathetic Jews and remit them to a committee in Israel twice a year. A third of the funds were distributed to those learning in yeshivas, a third was given to the poor and the remaining third was used to defray Jewish community expenses. Today, the ultra-Orthodox are taught that their Torah learning sustains the Jewish people and it is a privilege to support them. Rivka Neriya Ben Shahar, a lecturer at Sapir Academic College in Ashkelon and researcher on the haredi community, notes that this attitude is based on a biblical midrash about the tribes of Zebulun and Issachar. Zebulun, comprised of merchants, supported the scholars and teachers of Issachar. Increasing numbers of haredi men want to work, but many have not been given basic tools for a profession, says Ben Shahar. And it is unlikely that the requests for support will disappear. Although the unending intrusions often annoy me, I am proud of the Jewish tradition of charity. I, in turn, wonder how God sees the rest of us as we stretch out our hands in supplication in our time of need, and beg for mercy from the source of all giving.